All I'll reveal here is that charge is directly proportional to both voltage and capacitance. This equation is an easy one to find on your own, by researching through various electronics textbooks! Follow-up question: calculate the amount of charge stored in a 330 mF capacitor charged with a voltage of 12 volts. What would happen if a 10 mF capacitor, charged to a voltage of 6 volts, were connected to a completely discharged (0 volts) 22 mF capacitor? What would the voltage(s) be across each capacitor, after enough time had passed for complete equalization to occur? Voltage across each capacitor = 1.875 volts. The most important aspect of your students' answers is how they arrived at them. There is more than one way to solve this problem! Eventually, the voltage across capacitor C2 would be equal to the battery voltage. Challenge question: how do the relative sizes of the capacitors (in Farads) affect this process? For example, what if C1 = 10 mF and C2 = 470 mF? Or, what if C1 = 330 mF and C2 = 2.2 mF? Explain your answer. This question previews flying capacitor circuits. This type of circuit is often referred to as a flying capacitor circuit, with C3 being the "flying" capacitor. Explain why this is, and what possible benefit might be realized by using a flying capacitor circuit to sample a voltage. 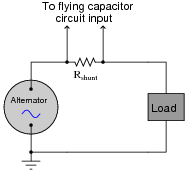 Flying capacitor circuits are used to provide galvanic isolation between a sampled voltage source and voltage measurement circuitry. I once worked for a company where thousands of these "flying capacitor" circuits were used to sample voltage across numerous series-connected electrochemical reduction cells, whose common-mode voltage could easily exceed 500 volts DC! This primitive technology provided isolation so that the data acquisition circuitry did not have to deal with that high common-mode voltage. Incidentally, the relays we used were hermetically sealed, mercury-wetted contact, reed relays. These relays had a surprisingly long life, often several years! They were cycled at around 20 Hz, for several cycles, about once every minute (24 hours per day, 365 days per year). The frequency of the alternator's output is 50 Hz. How does this affect the design of the flying capacitor circuit, so we ensure a fairly accurate reproduction of the AC signal at the output of the flying capacitor circuit? Generalize your answer to cover all conditions where the input signal varies over time. The switching frequency of the flying capacitor circuit must exceed the output frequency of the alternator by a substantial margin, or else the signal shape will not be faithfully reproduced at the circuit's output. Challenge question: if you were the technician or engineer on this project, what switching frequency would you suggest for the flying capacitor circuit? How would this criterion affect the design of the flying capacitor circuit itself (capacitor values, relay versus transistor switches)? Ask your students to sketch an approximation of the flying capacitor circuit's output waveform for different sampling frequencies. This question is a great lead-in to a discussion on Nyquist frequency, if your students are ready for it! An important aspect of this question is for students to generalize from this specific circuit example to all systems where signals are sampled along discrete time intervals. In modern electronic circuitry, especially data acquisition circuitry, sample time can be a significant issue. In my experience, it is one of the primary reasons for digital systems giving poor results. 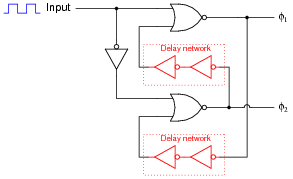 Note: the f1 and f2 pulse signals are collectively referred to as a non-overlapping, two-phase clock. 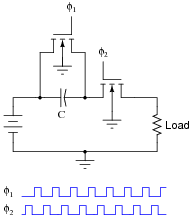 Consider the average amount of current through the load resistor, as a function of clock frequency. Assume that the ön" resistance of each MOSFET is negligible, so that the time required for the capacitor to charge is also negligible. As the clock frequency is increased, does the load resistor receive more or less average current over a span of several clock cycles? Here is another way to think about it: as the clock frequency increases, does the load resistor dissipate more or less power? It should be obvious in this circuit that the load current decreases as variable resistance R increases. What might not be so obvious is that the aforementioned switched capacitor circuit emulates the variable resistor R in the second circuit, so that there is a mathematical equivalence between f and C in the first circuit, and R in the second circuit, so far as average current is concerned. To put this in simpler terms, the switched capacitor network behaves sort of like a variable resistor. Calculus is required to prove this mathematical equivalence, but only a qualitative understanding of the two circuits is necessary to choose the correct equivalency from the following equations. 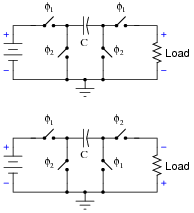 Which one properly describes the equivalence of the switched capacitor network in the first circuit to the variable resistor in the second circuit? Be sure to explain the reasoning behind your choice of equations. Perhaps the most important aspect of this question is students' analytical reasoning: how did they analyze the two circuits to arrive at their answers? Be sure to devote adequate class time to a discussion of this, helping the weaker students grasp the concept of switched-capacitor/resistor equivalency by allowing stronger students to present their arguments. Identify the polarity of voltage across the load resistor in the following switched capacitor circuit (called a transresistor circuit). Note: f1 and f2 are two-phase, non-overlapping clock signals, and the switches are just generic representations of transistors. Identify the polarity of voltage across the load resistor in the following switched capacitor circuit. Note: the only difference between this circuit and the last is the switching sequence. What difference would it make to the output signal of this operational amplifier circuit if the switching sequence of the switched capacitor network were changed? What difference would it make if the switching frequency were changed? The op-amp circuit will act as an inverting or non-inverting amplifier, depending on the switching sequence. Gain will be affected by switching frequency. Challenge question: the second switched capacitor network is often referred to as a negative resistor equivalent. Explain why. Some of the versatility of switched capacitor networks can be seen in these two circuit examples. Really, they're the same circuit, just operated differently. Discuss with your students how this versatility may be an advantage in circuit design. Note: f1 and f2 are two-phase, non-overlapping clock signals. The mathematics required to derive these equations directly may be beyond your students' ability, but they should still be able to research them! Some of the networks are directly equivalent to one another, making it easier for your students to associate equations: for instance, circuit F is equivalent to circuit B, and circuit E is the same thing as F except for the polarity inversion. It should not take a great deal of analysis to realize that circuits A and B must have the same equation as well. Given the fact that a switched-capacitor network has the ability to emulate a variable resistance, what advantage(s) can you think of for using switched-capacitor networks inside of analog integrated circuits? Identify some practical applications of this technology. Switched-capacitor networks allow us to have electronically variable resistors inside integrated circuits, with no moving parts, which is a technological advantage over standard resistors. Another advantage of switched-capacitor circuits is that they typically require less substrate area on an integrated circuit than an equivalent resistor. A huge advantage is that switched-capacitor networks may be manufactured to give much more accurate resistances than plain resistors, which is important in filtering applications. I'll let you research (or dream up) some practical applications for this technology. This question could very well lead to an interesting and lively discussion with your students. Once students recognize the equivalence between switched-capacitor networks and resistors, it is a short cognitive leap from there to practical applications where variable resistances would be useful (especially in an integrated circuit environment, where moving parts have traditionally been out of the question). Also, write an equation describing the cutoff frequency in terms of switching frequency and capacitor values. Note: in order for this circuit to be practical, fswitch >> fsignal. This question asks students to substitute a switched capacitor network for the fixed resistor in the original filter circuit. Similarly, algebraic substitution is required to derive the equation for cutoff frequency. 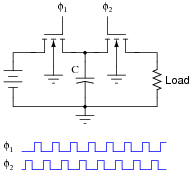 A 4.7 mF capacitor (Ci) is charged to a voltage of 4 volts, then connected to the inverting input of an operational amplifier (with a 10 mF feedback capacitor, Cf). What happens to the voltages across Ci and Cf? Explain your answer in detail. VCi goes to zero, while VCf increases by 1.88 volts. The reason why VCi goes to zero, of course, is a function of the opamp's negative feedback. 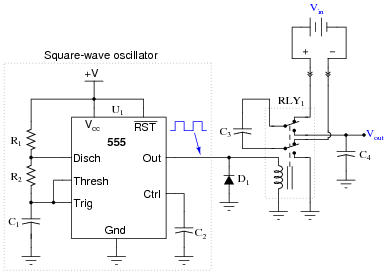 This aspect of the question provides an excellent opportunity for review of basic opamp principles. Although it will be obvious to many of your students, you might want to ask "why do we call the two clock signals non-overlapping?" What, exactly, would an overlapping set of clock signals look like, in comparison? The fact that switched capacitor networks can behave equivalently to resistors is exploited in a variety of integrated circuits. At first, this may seem strange, as switched capacitor networks generally require at least two switching transistors and a two-phase, non-overlapping clock (in addition to the capacitor itself) in order to function, which seems like a lot of peripheral circuitry compared to a single resistor. What possible advantage is there to using switched capacitor networks in integrated circuits instead of resistors? Support your answer with research, if possible. Switched capacitor networks are not just resistor equivalents, they are variable resistor equivalents. 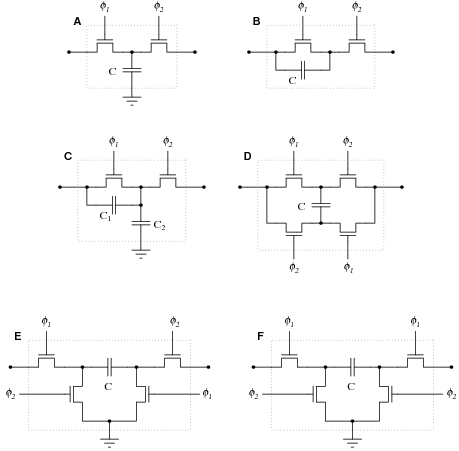 Also, these networks actually tend to be smaller than integrated circuit resistors, and are less prone to drift. There are other advantages to switched capacitor networks, but these are just some of the basic reasons behind their prevalence in modern integrated circuits. Ask your students to explain why switched capacitor networks are less prone to drift than resistors constructed on a semiconductor substrate. Just focus on one source of drift, such as temperature, to simplify the topic. What effect does temperature have on a semiconducting resistor, and why? What effect does temperature have on a capacitor built of semiconductor layers separated by an insulating layer, and why? With discrete components, are capacitors more stable over time than resistors? Why or why not?